My Favorite Husband told the story of George and Liz Cooper, "two people who live together and like it." The radio series was based on Isabel Rorick's novel Mr. And Mrs. Cugat. 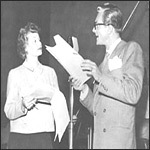 The show's audition broadcast featured Lucille Ball as a "daffy but intelligent" housewife and Lee Bowman as her husband, "the fifth vice president of a Midwestern bank." The broadcast received tremendous response from listeners and critics alike and was moved into CBS summer lineup on July 3, 1948. However, contractual obligations forced Bowman to bow out of the male lead and Richard Denning was quickly cast as Liz's husband. My Favorite Husband ran on CBS Radio through March 31, 1951.